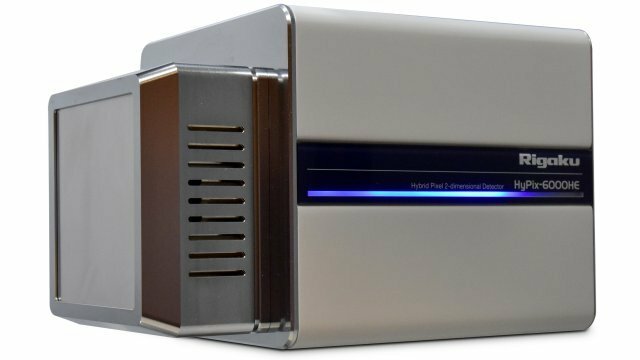 The XtaLAB Synergy-R is the most powerful small molecule diffractometer available. It includes a high-flux, low-maintenance microfocus rotating anode, the PhotonJet-R, with a high-precision kappa goniometer and Rigaku’s own Hybrid Photon Counting (HPC) X-ray detector the HyPix-6000HE. The PhotonJet-R X-ray source is comprised of a Micromax-007 HF rotating anode and a newly designed optic. It is available with either Cu or Mo anodes. This single crystal X-ray diffractometer has been specially designed to fully integrate the rotating anode X-ray source with all system components and software making it a sleek, simple to use diffractometer without compromising the X-ray intensity. For labs with high-throughput requirements, increasing the flux reduces data collection time and thus increases the number of samples that can be studied in your laboratory. For extremely small samples, additional flux will extend the minimum size limits for crystals that you can study. 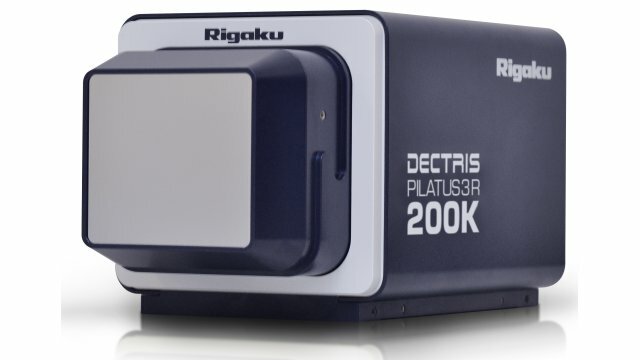 Rigaku Oxford Diffraction now offers the HyPix-6000HE Hybrid Photon Counting (HPC) detector. Like all HPCs, the HyPix-6000HE offers direct X-ray photon counting, single pixel point spread function and extremely low noise. The HyPix-6000HE HPC offers a small pixel size of 100 microns, which allows you to better resolve reflections for long unit cells as well as improving reflection profile analysis. The HyPix-6000HE has a high frame rate of 100 Hz, as well as a unique Zero Dead Time mode providing the ultimate in error-free shutterless data collection. The PILATUS3 R 200K is a hybrid photon counting (HPC) detector designed to achieve the best possible data quality for diffraction experiments. HPC detectors are direct-detection, single-photon counting devices that have essentially no noise and high sensitivity. Moreover, the high dynamic range excellent DQE characteristics for the PILATUS3 R 200K means that they it is well suited for accurately measuring weak reflections alongside very strong reflections - overload corrections and separate scans for weak and strong data are not necessary. The readout time for the PILATUS3 R 200K is 7 msec readout speed, making it capable of true shutterless data collection, thus removing errors associated with shutter open/close and goniometer start/stop events. HPC detectors have revolutionized the way data are collected at synchrotrons and the PILATUS3 R detectors bring those same capabilities to collect the best possible data at home. 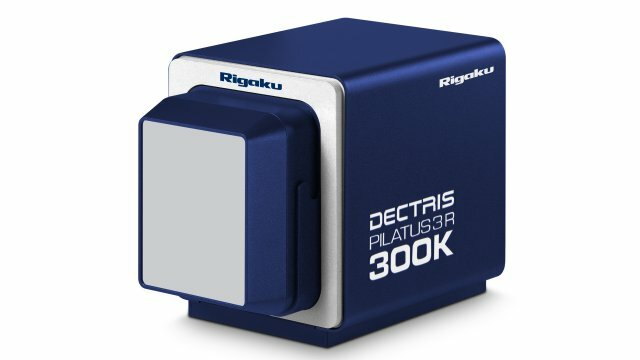 The PILATUS3 R 300K is a hybrid photon counting (HPC) detector that is desirable by labs who desire the benefits offered by PILATUS detectors combined with 4-circle goniometers, but prefer a larger active area. HPC detectors are direct-detection, single-photon counting devices that have essentially no noise and high sensitivity. Moreover, the high dynamic range excellent DQE characteristics for the PILATUS3 R 300K means that they it is well suited for accurately measuring weak reflections alongside very strong reflections - overload corrections and separate scans for weak and strong data are not necessary. The readout time for the PILATUS3 R 300K is 7 msec readout speed, making it capable of true shutterless data collection, thus removing errors associated with shutter open/close and goniometer start/stop events. HPC detectors have revolutionized the way data are collected at synchrotrons and the PILATUS3 R detectors bring those same capabilities to collect the best possible data at home. 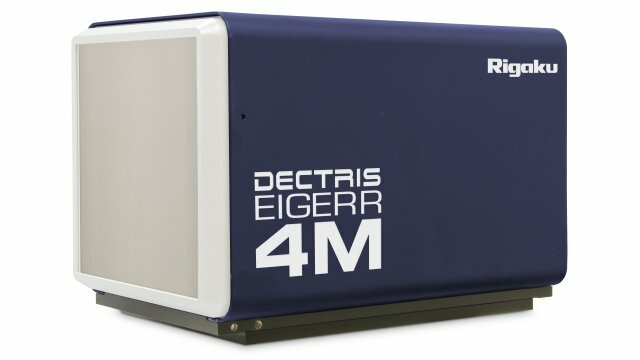 The EIGER R 4M is a new generation of hybrid photon counting (HPC) detector that combines exceptional data collection efficiency and resolving power with an active area rivaling that of CCDs and imaging plate detectors. HPC detectors are direct-detection, single-photon counting devices that have essentially no noise and high sensitivity. The EIGER R series is the latest generation of HPC detectors that feature auto-summation, which extends their digital counting ability up to 32-bits, or more than 4.2 billion counts, per pixel. Moreover, the EIGER R 4M delivers these high count rates with continuous readout, achieving duty cycles greater than 99%. The EIGER R 4M detector have small (75 μm) pixels with a single pixel point spread function to provide superior resolving power for reflections from samples with long unit cells, like macromolecules. In general, one can collect at sample-to-detector distances that are 20 - 30% shorter than those used for CCDs or PILATUS detectors. With this state of the art EIGER R 4M detector, you can unlock the true potential of your laboratory instrument.